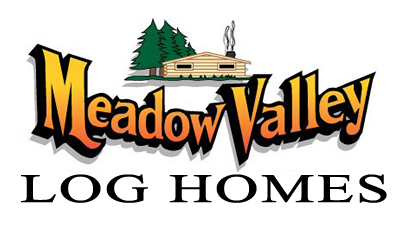 Meadow Valley Log Homes has been in business since 1983. We currently have over 1000 homes through out the upper midwest from West Virgina to North Dakota. We’re willing to make arrangements to travel anywhere needed to build your log home. Meadow Valley Log Homes’ emphasis from the beginning was to provide a custom built log home at affordable prices with personal attention given to the homeowner. Emphasis is on quality as well as design to fit your particular lifestyle. At Meadow Valley Log Homes we’re interested in developing a relationship with you the customer so that we’re able to more fully understand your needs and dreams in a log home. We hope to become not only your builder but also your friend. We are confident you will find building with us to be an enjoyable experience. We purchase our white pine logs from many sawmills around the state of Wisconsin. Debarked 10″ square cants are delivered to our yard in Mather. From there, they are stacked in inventory for a period of time to allow them to air dry. From this cant inventory we pull log lengths specific to your own individual home. These logs are specified by our design personnel based on a row by row layout done for your particular home plan. In Mather, these cants are then milled to the finished profile we use in building your home. Some logs will be precut and notched prior to delivery. Other logs will be cut and notched on site by our building crew. This allows for corrections should a foundation be slightly out of line as well as more precise interior notches, window and door openings. After milling, logs get a shower treatment to prevent mold or fungus growth on the surface of the logs during staging, shipment and construction. The logs are then staged in our paved yard where they are loaded on our log truck and delivered to your job site. Our facility at Mather also includes our siding shop where we mill our siding and timber log products. We have large warehouse space which allows us to store our siding products in a weather proof environment to ensure first rate quality to our customers.